The Horror Section: "Nobody's Afraid Of The Mailman." "Nobody's Afraid Of The Mailman." Last night I trekked out to the Bloor to take in a little movie called Dark Night Of The Scarecrow. Having been a made-for-television movie from the early eighties, this was the first time it had ever been played on the big screen. The format was a newly restored version that will be released on DVD later this year. I had never seen this movie before, but its reputation preceded it. You don’t have to go very far into the horror blogosphere to find someone who speaks of this film fondly. It clearly affected a great deal of people during its initial broadcast and later on VHS. I have a question. Why is the scarecrow such an untapped icon of fright? They are frickin’ creepy man, yet you can probably count the number of movies featuring our straw-filled fiends on one hand. After a vintage 16mm trailer for The Bird With The Crystal Plumage (awesome, awesome, awesome! ), the Scarecrow was unleashed! After a simple-minded man named Bubba (Larry Drake) is mistakenly gunned down by a lynch mob headed by local mailman Otis Hazelrigg (Charles Durning), they start being haunted by a lone scarecrow. Initially, they think someone is having fun with them, until the first of the group meets a grisly end. Does someone in town know their secret, or has Bubba come back from the grave for revenge? 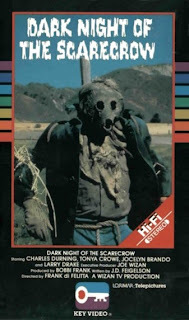 Dark Night Of The Scarecrow appears fairly dated now, but that works as much in its favour as it does against it. You might assume that the Spartan nature of the production was to fit into a teleplay mold, but it was actually originally written as a feature and not much, if anything, was changed for its transition to the small screen. It is standard fare, but there is something oddly watchable about it. The story is fairly predictable as I found myself on several occasions to be one or two steps ahead of the narrative – though the ending IS pretty cool – and yet again I was still engaged. It also helps that the piercing score, very indicative of that time period, enhances the movie immensely. Durning excels as the town’s slime ball mailman. He strides around the movie with an air of self-importance that the rest of the townspeople seem to half-tolerate and half-fear. I’d say the biggest weakness of the film is the conspicuous lack of the title character. There are very few shots of the scarecrow itself, which is a shame because there was huge potential to be capitalized on there. The last shot of the scarecrow at the end of the movie is super creepy and I just wish there had been more of it. I understand that the filmmakers were subscribing to the ‘less is more’ theory, but there’s ‘less’ and then there's ‘too little’. And when I say ‘too little’, I’m not referring to the lack of violence either. Even as much of a gorehound as I am, I certainly don’t NEED the sticky stuff to have a good time. As for the transfer, it looks superb. They certainly took great care (‘they’ presumably being Image Entertainment) in cleaning it up and fans looking to reacquaint themselves will be very pleased. J.D. Feigelson, the writer of DNOTS was in attendance and stuck around after the screening for a Q&A. He spoke about being unaware there was even a following for this movie until encountering all the kind words online. The most surprising thing about the movie is how close to the script the end product was. According to Feigelson, you could literally read along with the original script, which, let’s face it, is unheard of these days. He also pointed out that he is in no way threatened by the idea of a remake, saying that the original would always be locked in and whether another take on it turns out to be better or worse is completely irrelevant. Though I don’t think Dark Night Of The Scarecrow is anything to write home about, there is something to be said for straightforward storytelling done well. With everything in your face these days, it is nice to go back and see how filmmakers told stories back in simpler times. That movie scared the crap outta me as a kid...I had nightmares about scarecrows for years. Thanks for this review..I nevr could remember the name of the movie. Alma Is Coming... And She Is Pissed! A Scary Game For Scary People.